United is rolling out the 777-300ER to its fleet. These planes will be the first to feature the new Polaris business class seating, with direct aisle access. The plane features 60 Polaris class seats, 102 Economy plus seats, and 204 Economy seats. The 1:2 ratio of E+ to E is better than the 747 (~1:2.5) that this plane will generally replace, although worse than some of the 777-200 (UA 1:1; CO 1:2) it will replace on some routes. All economy seating is in a 3-4-3 format (except for 2-4-2 in the last two rows of the plane). 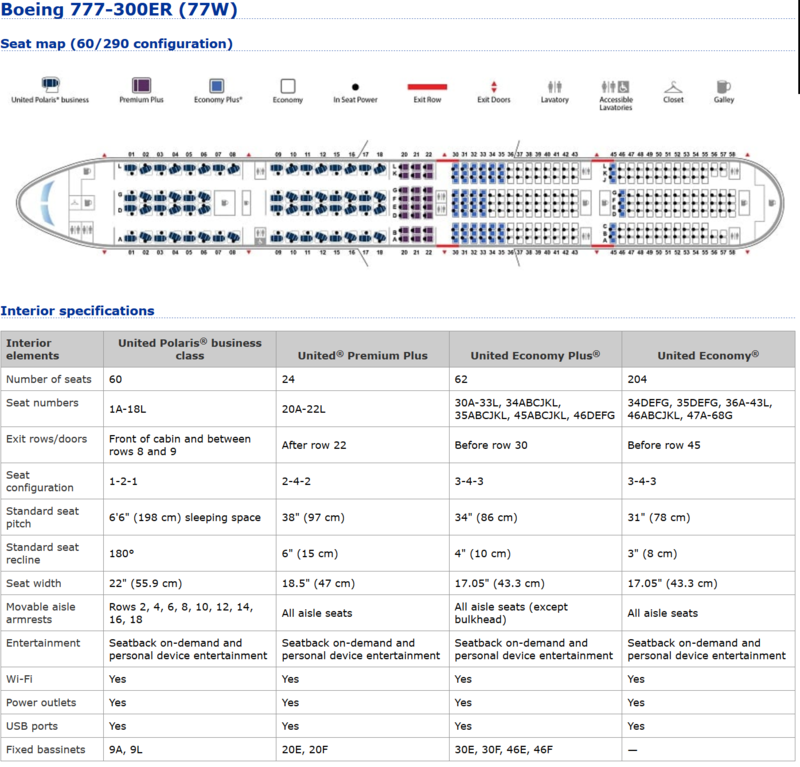 Seat width in economy is 17", down from the 18" in the sUA 777-200, and slightly narrower than the 787 width of 17.3". Bassinets are provided in 19EF, 23EF, and 40EF - the center seats on the three bulkhead rows. Polaris seats have their own power outlets; Economy seats also have power (2 outlets per 3 seats or 2 per 4 seats; all bulkhead seats have their own power). Each seat has a dedicated USB power port as well. I flew on the media preview flight this week and wrote up a detailed report on which seats are good and bad on the new United 77W. Here's a summary of my thoughts. Bulkhead seats remain the best choice for foot well reasons. "Straight" seats are second best while angled seats have a tapered foot well for the last 10 inches of the bed length. Row 16 has no window. Row 18 has one window far to the rear and part of another forward. The angles are such that you can barely see out of either. Accessible lav at 2L is the largest on board and useful for PJs changing. Row 1 has no overhead bins in the center. Galley at 2L/R handles crew meals so will be busier than the forward galley throughout the flight. The downside of the "straight" seats is the 9" notch to slide in through but overall those will remain my seats of choice. Avoid 6/7/8 for noise reasons IMO. Mini-cabin is probably the best choice. Or row 39/40. AVOID 24A/L at all costs. Freezing cold in flight and the narrowest seats on board. Plus no window. Aisle seats are a smidgen narrower and the center 4-block has legroom issues. Bulkhead seats have good legroom, very similar to what extending your feet on a normal row would offer. Row 50 outside pairs are some of the best, though all the way at the back. A little extra space (especially under-seat stowage) and still some overhead space, something 51 lacks. Row 51 also has a misaligned window. 51/52 in the center are lacking overhead bins. 37 on the outsides are lacking overhead bins. 5A/L IMO is the perfect seat. Far enough from both galleys, and the added privacy of the odd numbered rows. Thanks. I thought I read before before that it was good but when did not see it on the latest list so started second guessing my decision. I’m on tomorrow’s (Monday’s) UA724 HNL-SFO and it’s been switched from 772-A to 77W. I was auto-assigned 4G but the Polaris cabin is wide open so I’ve taken the plunge with 9A. 15A is my trusted choice as it’s near the back so very little traffic heading to/from the lab/galley, and it’s in front of the wing for a decent view. I’ll see how 9A goes (next to lav/galley) and it’s a nice short flight to check it out. 1A was fine for me on SFO-HKG but I guess I may have been lucky with well behaved HKG based FAs. There must be lots of lucky upgraders for tomorrow. As I stated, 5L on the 777-300ER. Is the #1 Seat. I've flown it couple of times, and I keep falling in love. Find More Posts by .Benjamin. What about row 5? I checked it out on my flight yesterday and it looked like it was far enough from everything... My go to is 9L but likely going with 5L on my return flight. It's okay. You can get some noise from the rear galley. I prefer row 3. In addition to the FTers’ popular single seats in the odd rows: 3, 5， 9， 1 (not for me ever again), I would like to share that I have grown to like 17A and 17L. Yes, row 3 and 5 in the front cabin are popular, but there is still a lot of foot traffic between the two galleys and restroom areas. I have found little foot traffic sitting in row 17. The only foot traffic is from row 18 (last row of Polaris cabin). My best rest and sleep have come from sitting in row 17 window seats in my over 20 United 777-300ER flights. Unfortunately, Row 3 was already taken. It is between 5L and 9L (well, was available when I last checked but that may have changed). But i just did 9L. In fact, have only done 1A, 9A and 9L. Thought to try different. The last rows of Polaris you're very close to the motors... That's why 5L is kind of perfect when it gets to having a Window seat, and the noise situation. Congratulations! On a day flight 9A would be great. I was in 9A on SFO-HKG and it is the larger lavatory and there is no door stop so when someone would open it with too much force it would bang and wake me up. Could not actually hear noise from the lavatory. Next time I would choose 9L on a red eye. I loved 1A but it was a day time flight so noise from the gallery was not an issue. I tried 5L for my flight. Well, for part of it. There were young children in row 6 and, as kids are, they were not particularly quiet when awake. I have no issue with kids at all. They were very cute but I wanted a quieter area. Luckily 9L was empty so I eventually moved there. I think I also like 9L because I can't see the person next to me in 9G at all since the row is not staggered and the seat next to me is not angled. In 5L, I could kind of see the person in 4G because the seat was slightly ahead and angled. While people waiting for bathroom can see 9L, I rarely saw anyone wait or even wait and stand in a position where they would look into the seat. I did not have any issues hearing noise from the middle galley while I did hear noise from the front galley in 5L. 5L was definitely good but I think I will stick with 9L going forward (assuming available). Thanks for all the advice! And I appreciate these are very first world problems. I am happy I get to fly business at all. Not a given for me so I definitely try to make the most of it when I do. UA_Flyer, Kacee and Taoyuan like this. I'm planning to book EWR-NRT-EWR for myself and my husband, and I'm debating seat choices. I really want a window seat on one leg, to see out over Alaska/Artic, and I guess we'd pick window seats one in front of the other. I'd then pick an odd-numbered D/G on the other leg for spouse time. Any recommendations on which leg would have the best views and be worth it do windows? The flight there is 11am - 1:55 pm next day; flight home is 5pm - 4:45pm. I'm not sure you'll see much given the polar routing on the flight to Tokyo, but I'd probably pick an odd seat on the port side (A/D seats) on the return flight UA78 for the off chance of catching the Northern Lights in the darkness. I would take either side window on the flight to NRT; the westbound flights often fly further north and are all daytime, so you may get some impressive views of northern Canada and Alaska. The eastbound flight often flies much further south (sometimes making landfall back in the US around Seattle) and it will be night for most of the Pacific crossing. Thanks for the suggestion! You info about the flight path was so detailed. I decided to book what you suggested. I'd rather have a guarantee of the great views during the day than be potentially disappointed if I don't see the Northern Lights. I also have a feeling I'll be sleeping more on the way home, due to it feeling like night and being exhausted after a long trip. and I guess we'd pick window seats one in front of the other. IMO the very limited ability to tap each other on the shoulder is not worth the cost of the aisle seat, and I would do consecutive odd windows if available.